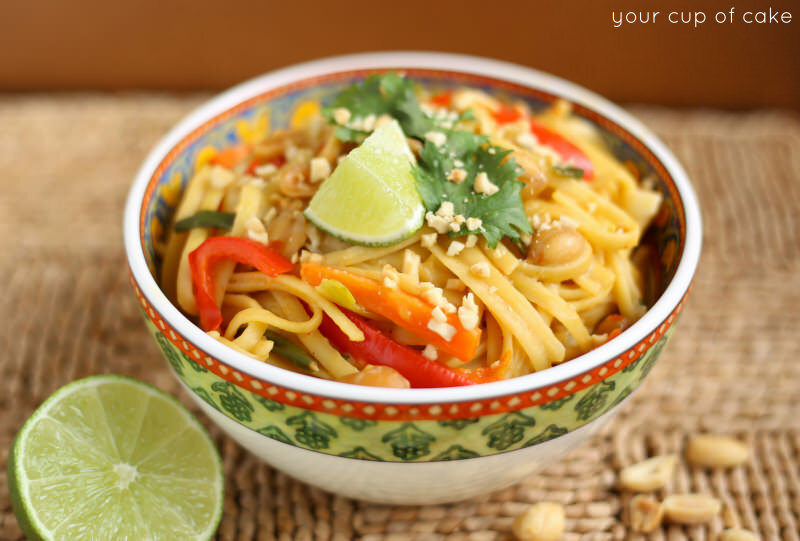 Thai inspired pasta that will leave you with only one dish to clean! 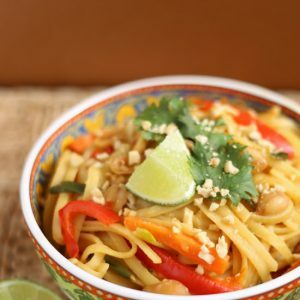 One Pot Thai Peanut Pasta is what I had for dinner this week! I just love pad thai, but I wasn’t quite ready to dive into the real thing. So I decided to take an interpretive (and really easy) route instead. Freaking out? 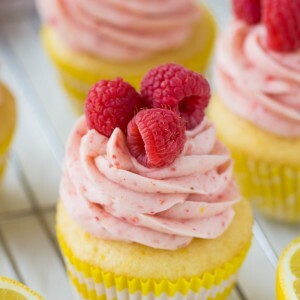 I’m the cupcake girl… what am I doing making real food right? Well I’ve made real food before, I’ve even posted about it! 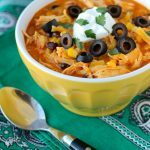 My Slow Cooker Chicken Enchilada Soup is absolutely incredible and I make my 15-Minute Taco Soup every month because it’s just that easy! 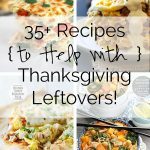 Plus, make it after Thanksgiving with some leftover turkey and you’ll be so happy to only have to spend 15 minutes in the kitchen and you can take a break from traditional Thanksgiving flavors for a meal. 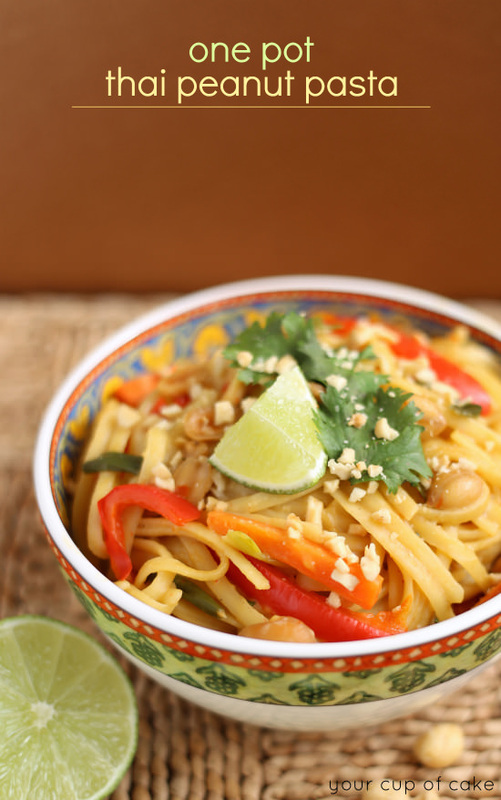 Anyway, on to this awesomely easy Thai Peanut Pasta! 1. Place all pasta ingredients in a large pot and bring to a boil. Reduce to a simmer and cook for 10 minutes or until the pasta is al dente. Cover during cooking if you want to keep more liquid. 2. Remove from heat and remove ginger slices. Stir in lime juice and cilantro. Serve and top with chopped peanuts, extra cilantro and lime slices! 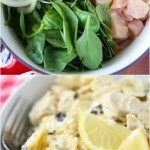 Recipe adapted from Apron Strings! So don’t freak out, I didn’t put the liquids in the pot yet, it looks prettier without them! I cracked my pasta in half because eating really long noodles isn’t that cute unless you’re planning on having a Lady and the Tramp moment. And a little garnish on top goes a long way 🙂 And as always, feel free to add more veggies or double up on the ones already in the recipe! Even chicken or shrimp would be a perfect addition! I love Asian inspired noodle dishes. . I could eat this for a week straight!! love! It’s been far too long since I’ve cooked up some Thai food. Love this one pot recipe. Looks wonderful! I’m assuming if you added turkey you put it in at the end? Looks great! How much would you say this serves? I’ll be making dinner for a big group. 8 people or so depending on the serving size! Do you think using a bag of fresh stir fry veggies would hold up? I’ve got a bag of it with broccoli, snow peas, bean sprouts, carrots, and red cabbage. I was never a fan of bell peppers in pasta so I got tht instead, but i don’t want the veggies to get all soggy. made this tonight and it was a hit! I added chicken at the end (grilled it first while pasta cooked). Served it with Peanut Sauce instead of crushed peanuts. 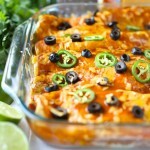 Would make this again with even more veggies!!! Thanks for the great recipe! Making this today. I love finding vegan one-pot meals, they are rare to find. I have tamarind paste from previous Thai recipes and I highly recommend using it if you can find it. 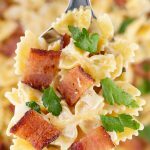 Thank you for posting this recipe, it was quick and easy and tasted wonderful – although I think I will add more veggies next time, this one is pinned in the I-will-definitely-make-again board. This was SO good we decided to make it again the next day. We added 1 cup of broccoli and another carrot while keeping the liquid ingredients the same. The end result turned out kind of goopy. I’m wondering how much to increase the vegetable broth when we add so many veggies? I made this for dinner tonight-it was delicious! I made a few changes: made with 16 oz. whole wheat pasta, added extra PB, some sriracha and LOTS of extra veggies (baby bok choy, mushrooms, sugar snap peas). I used 4 cups broth as called for but added a full cup of water since there was extra pasta and veggies. I served it alongside some sweet and spicy salmon. 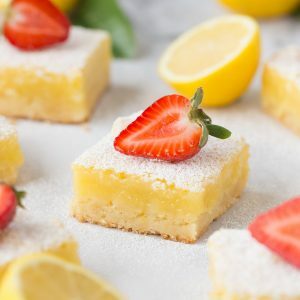 Thank you for this recipe, it’s genius! Awesome! Easy! Do it again in heart beat! We love this meal! The second time I made it i used zucchini ribbons instead of the pasta. Super low carb! Thanks for posting this. Made this tonight with the veggies I had on hand, including some shitake mushrooms and some tiny eggplants that I cubed. Excellent! and so easy! 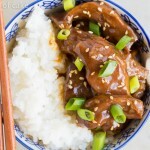 I didn’t have tamarind paste but will pick some up for next time I make this. Thanks! This is sooooo good! Thank you for sharing! Hi Lizzy, I just cooked this meal for the second time and I absolutely love it. Superfast dinner when expecting guests. I’m a German blogger and would much appreciate if I could post this on my blog with metric data for my blog readers. Surely with a link to your site and the original receipe. This was delicious will definitely make again. Couldn’t find Tamarind paste but googled for a substitute and it said to use vinegar instead in the same amount. I used apple cider vinegar and I only juiced 1 1/2 limes. Pomegranate Molasses/Paste also makes an excellent substitute (though maybe less common for some people to have on hand.) Pomegranate molasses/paste is more like tamarind, with the deep, tangy, slightly sweet flavor. If going the vinegar route, I might add just a tiny bit of brown sugar or molasses, or smushed up prunes, or raisins in a pinch, along with the vinegar, to get closer to the tamarind flavor. My grocery store doesn’t sell tamarind paste, but it does sell tamarind pods in the fresh produce section near the ginger root. It’s worth checking. They are brown pods. It’s common for the shells to be slightly cracked/broken. I try to find ones that aren’t cracked, but feel like they are ready to (you know they are ripe if the shell cracks easily.) You shell the pods, and then use your fingers to scrape the paste away from the big seeds. It’s messy & a little time consuming, but so tasty. made this last night, I added extra peanut butter. was a really a divine treat and it’s so great how quickly this could be made. I bet it would be great with tofu as well. Did you really boil the peanuts along with everything? space to solve my problem. May be that’s you! Looking forward to see you. Made this for a crowd and it was a hit! Very good. Delic. 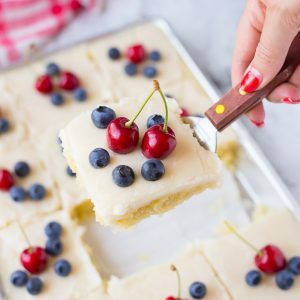 Delicious and very filling! Will definitely make again! I am a bad cook and I mean really bad. However, this is the first dish that I have ever cooked successfully. So easy and the tastiest meal I have had in a long time. Followed the recipe exactly and found all amounts were accurate to scale, however, I would say it only serves 4 maybe 5 as a main meal. Well it sounds like you’re not a bad cook any more! 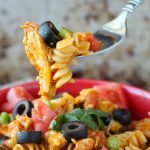 One pot recipes are always a great place to start if you feel uneasy cooking! I lOVE them! 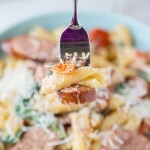 Try my one pot cheesy lemon pasta next!